We all use LED bulbs today to save energy. 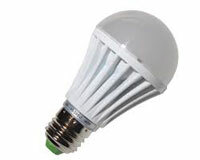 Different types of LED bulbs ranging from 3 Watts to 15 Watts are now available at low cost. The LED bulb has an array of serially connected 0.5 watt Chip LEDs and a small capacitor power supply. We can also easily make the LED bulb. Let us see what is inside the LED bulb and the circuit operating it. A simple Transformerless power supply is used to drop 230 V AC to low volt AC which is then rectified and smoothed by a diode bridge and an electrolytic capacitor. See diagram below. C1 is the X rated capacitor for dropping the high volt AC. It is rated 400 Volts to protect from high inrush current. The 470 K Bleeder resistor connected in parallel to C1 removes the stored current from the Capacitor C1 at power off. This resistor is a must to prevent shock from the stored current. Its value can be between 470K to 1 M. See table below to select the value of the capacitor based on the number of LEDs used and the power rating of the LED bulb. A standard Full wave Bridge Rectifier made up of 4 IN 4007 diodes is used to rectify the DC. Soothing capacitor C2 may be a small value one such as 47 uF. From the Rectifier, DC is directly fed to a number of 0.5W White LED chips. The number of LEDs depending on the output voltage from the Capacitor C1. See table to select the number of LEDs in the chain. The output light and power of the LED bulb depends on the number of LEDs connected serially. Caution: The circuit is directly connected to 230 V AC and can give a lethal shock. So do not touch or troubleshoot the circuit when connected to mains. Do not touch of the PCB or LEDs when connected to mains. There will be shock in all parts of the PCB.